Three-quarter mile wide tornado in Joplin, Missouri. This year's tornado season may prove to be the deadliest on record in the United States. As horrific as the damage is, the tornado victims in the South are lucky they live in America. Sunday night, May 22nd, a three-quarter mile wide tornado cut a six mile path through Joplin, Missouri, a town of 45,000. So far, 116 are known dead and the death toll is expected to rise. 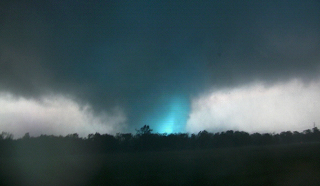 Prior to the tornado in Joplin, 350 people have lost their lives as the result of severe weather and tornadoes throughout the South. With the Joplin deaths, almost 470 people have died this tornado season. If only one person died or one home was destroyed, there is still a family that has lost a loved one or their property. However, when we compare the devastation in the United States to disasters around the world that have claimed tens of thousands or hundreds of thousands of lives, the toll in America pales. Over the last 40 years, we've seen 15,000 people die in Japan due to the earthquake and tsunami and 9,000 are still missing. Over 250,000 people died in the 2004 Indonesian tsunami. An earthquake killed 255,000 people in 1976 in Tangshan, China. In a matter of minutes, 350,000 people died in Haiti from an earthquake. These death tolls are staggering and incomprehensible. What makes these tragedies worse than anything we've ever had in the United States is that all of these killer events happened in areas that were predominantly poor, with the exception of Japan. In America, we have resources from all over the country that can shipped, flown, trucked or carried to areas of devastation. We have heavy equipment that can clear the debris and first class medical care that can take care of the injured. In China, Indonesia and Haiti there were no hospitals to rush to. There were no emergency vehicles or trucks coming. There were no helicopters there in minutes to rescue the severely injured. Poverty, lack of medical supplies, lack of food, lack of water, lack of help, all contributed to the death tolls in these disasters. Haiti has barely made any progress with clearing the rubble, well over a year later. Look how quickly New Orleans was cleaned up and back on its feet. Yes, there are thousands of people that were forced out of the city and may never be able to rebuild or come back. But a few years after Katrina crushed the Big Easy, a team held high a Super Bowl Trophy. There won't be any trophies for anything in Haiti a year or more from now. This should serve as a reminder of how great America is compared to the rest of the world. We have an amazing country. You see it in the way we gather resources, recover the trapped, heal the injured and rebuild the cities. And we still find ways to provide massive amounts of humanitarian aid to those in need around the world. The next time you hear someone complaining about how bad America is, tell them to ship their sour butts off to central China and have an earthquake rock their world. Or why don't you tell them to get their negative attitude down to Haiti and see how much needs to be done there for the next five to ten years or more. I remember how George W. Bush was thrashed for his tardy response to hurricane Katrina. Yes, things could have been done much better with regard to the White House, FEMA and the other support agencies involved in the salvation of New Orleans. In Haiti their hands are still out. Whole sections of Indonesia will never recover. In Japan, radiation may keep people away from the towns where they have spent their whole lives, forever. And the radiation threat in Japan is far from over. We can bury the dead, clean up the rubble and rebuild the towns. We'll grieve for the lost and what was lost, but nothing that has happened here is close to the gravity of what has happened there - outside of America. We pray for the people of the South, but we also feel that the tornado victims in the South are lucky they are in America. To help, in America or abroad, contact the Red Cross.